“It’s a strange policy of a mayor to allow a conservation area to be developed instead of being rehabilitated,” Sobirin said. Hundreds of Punclut residents, environmentalists and artists protested on the streets of Bandung on Thursday, rejecting the planned construction of a hotel and resort in Punclut, a water catchment area in North Bandung. The protesters criticized Bandung Mayor Dada Rosada for issuing a permit for PT Dam Utama Sakti Prima (DUSP) to turn 60-hectare plot in Punclut into a tourism and business project. They said the permit violated regional regulations that designate Punclut as part of a water catchment, and could worsen floods during the rainy season and cause water shortages in the dry season. 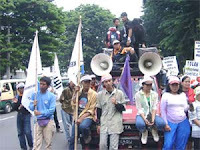 A performing arts show kicked off the protest, the second such protest, and was followed by a speech in front of the Gedung Sate building, which houses the Bandung City Council and governor’s office. Sobirin, an expert member from the Council of the Sunda Territory Environmental Observer who took part in the protest, criticized the mayor for issuing a permit at a time when many people were demanding stricter control of the North Bandung conservation area. Moreover, he said the alleged construction of an access road by PT DUSP following the issuance of permit No. 593/01-DBM/05 on Jan. 12 was against local bylaw No. 2/2004 on Bandung’s spatial planning. Article 100 of the bylaw cites that no new road access is allowed in the Punclut area to maintain its green space. PT DUSP president director Fandam Darmawan, on the sidelines of a seminar on Punclut organized by the Indonesian Geologists Association in West Java and Banten, told reporters that he only acted as executor of the permit. He said that only 20 percent of the 60-hectare site would be developed, while the rest would remain a green area. “If we (go on) with construction, we’d be helping to preserve water… we’ll build an environmentally friendly residential area that will be comfortable for its residents and local people in the vicinity,” Fandam said on Thursday. He said the disadvantages did not outweigh the project’s advantages, and his company was just waiting for Bandung administration approval to start construction. He said that so far, no development had started apart from a regreening project in a hilly area. Geologist Hardoyo Rajiwiryono disagreed with protesters, saying that based on the latest satellite image, Punclut was not the main water catchment, but a small one where construction should be allowed. According to Bandung’s water resources office data, around 6,020 hectares of reservoirs, or around 70 percent of water catchments in North Bandung, had been damaged due to residential development.